Mallorca remains and ever popular retreat. Palma in full Palma de Mallorca is the capital and largest city of the autonomous community of the Balearic Islands in Spain. It is situated on the south coast of the island Majorca on the Bay of Palma. As of the 2009 census, the population of the city of Palma proper was 401,270, and the population of the entire urban area was 621,000, ranking as the twelfth largest urban area of Spain. 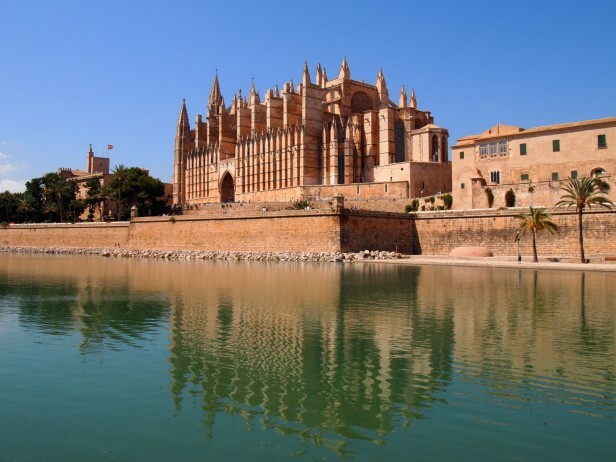 Almost half of the total population of Majorca live in Palma. The Cabrera Archipelago, though widely separated from Palma proper, is administratively considered part of the municipality. Its airport, Son Sant Joan, serves over 22 million passengers each year. The Marivent Palace was offered by the city to King Felipe VI of Spain. The royals have since spent their summer holidays in Palma. The Plaça d’Espanya is the transport hub of Palma. The Estació Intermodal caters for buses and trains (the latter controlled by TIB). The two old buildings home to the tourist information and several cafés sit either side of the two large escalators which lead into the Estació, which interestingly enough sits underneath a large and popular park. On the lawns are several glass boxes, which let in light and ventilation to the station below ground. There are also train-themed playing structures, each one shaped like a train carriage and named after towns along the line of the Ferrocarril de Sóller, a railway dating back to 1911 which has its Palma Station right next to the park. Just down the street from here a new bus station is under construction. At the centre of the plaza is a statue of James I, Conquistador of Majorca. The Old City (in the south-east area of Palma behind the cathedral) is a maze of streets clearly hinting towards an Arab past. With the exception of a few streets and squares which allow traffic and are more populated with tourists most of the time, the walkways of this city quarter are fairly narrow, quiet streets, surrounded by a diverse range of interesting buildings, the architecture of which is comparable with those in streets of cities such as Florence (Italy), for example. The majority are private houses, some of which are open to the public as discreet museums or galleries. The Old City is also home to the Ajuntament (or Town Hall), the Convent of the Cathedral and the Banys Àrabs. The Banys Àrabs, or Arab Baths, one of the few remnants of Palma’s Moorish past, are accessed via the quiet Ca’n Serra street near the Convent of the Cathedral, and include the lush gardens of Ca’n Fontirroig, home to Sardinian warblers, house sparrows, cacti, palm trees, and a wide range of flowers and ferns. The small two-roomed brick building that once housed the baths is in fact of Byzantine origin, dating back to the 11th century and possibly once part of the home of a Muslim nobleman. The bath room has a cupola with five oculi which let in dazzling light. The twelve columns holding up the small room were pillaged from an earlier Roman construction. The floor over the hypocaust has been worn away by people standing in the centre, mainly to photograph the entrance and the garden beyond it. The whole room is in a rather dilapidated condition. The other room is a brick cube with a small model of the baths as they once were in the corner. Arranging a private jet charter to and from Mallorca (LEPA / PMI) is straightforward. Palma de Mallorca airport lies approximately 10 kilometres from the centre of Palma and takes around 15 minutes by car. The airport lies approximately 30 kilometres from the beaches of Magalluf and Palma Nova and takes around 30 minutes by car subject to traffic, and approximately 60 kilometres from the resorts of Alcudia and Can Picafort in the North of the island. The journey time is around 45 minutes subject to traffic. A private jet charter from London to Mallorca will take approximately 2 hours 20 minutes in a 6 seat Cessna Citation CJ2 jet, and 2 hours 10 minutes in a 8 seat Cessna Citation XLS jet. Arranging a private jet charter or helicopter transfer with Freedom Air to arrive in style to Mallorca is simple. The Freedom Air team can be reached on +44 (0) 1275 548001 to book your next trip.